WASHINGTON (CNN) -- The military's controversial V-22 Osprey tilt-rotor aircraft will head to Iraq for its first combat tour later this year, Marine officials announced Friday. After 18 years and $20 billion in development, the plane will deploy to western Iraq in September to support Marine Corps combat operations for seven months, Marine officials said. The plane, which is intended to replace the Corps' 40-year-old fleet of CH-46 helicopters by 2018, can fly like a plane and land like a helicopter, giving the Marines more flexibility in the field, officials said. The V-22 can carry troops three times as far, twice as fast and has six to seven times more survivability than the CH-46 widely used now in Iraq, the military says. The Osprey's performance has also been noticed by the Air Force, which has plans to use it as a special operations aircraft. 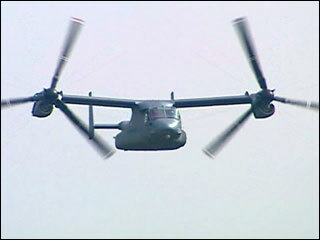 The aircraft has been redesigned after two fatal accidents in 2000 that killed 23 Marines. Accidents in 1991 and 1992 killed seven other people, but Marines say the plane's problems are in the past. "It's been through extensive operational testing and evaluation, and it is our fervent feeling that this aircraft is the most capable, survivable aircraft that we carry our most important weapon system in, which is the Marine or rifleman, and that we will successfully introduce this aircraft in combat," said Lt. Gen. John G. Castellaw, deputy commandant for aviation. Critics say the tilt-rotor design may still be too unsafe for the complexities of flying in combat operations. The Marine Corps maintains it is a much more controllable aircraft in those situations. Since 2003, the Marines have lost seven aircraft in combat operations. The Marine Corps says the V-22 can better avoid being shot down because it can fly higher than the missiles that have been targeting helicopters. In addition, people on the ground cannot hear the aircraft approaching, giving insurgents less time to prepare to shoot as it flies at low altitude. "I flown the V-22, and I have taken it and used it in a tactical manner," Castellaw said. "The ability to maneuver this aircraft is far in excess of what we have with the existing helicopters." A Marine Corps Osprey drops troops during a 2006 test at Camp Lejuene, North Carolina.